Joan Porter Bruce, 98, formerly of Jasper, GA, passed peacefully from this life into the next on Saturday, December 1, 2018 in Big Rapids, MI. Joan was born October 2, 1920, on a farm near Dalton, GA. She was the fourth of twelve children born to Alpheus E. and Ellen (Huggins) Porter. Joan spent her working life in service to others; in restaurants, hospitals, nursing homes, department stores, and on the family farm; though she occasionally remarked that the farm was her least favorite job. Joan was a true "people person" and was happiest when helping others. She was a wonderful cook and often prepared huge meals enjoyed by anyone who "happened" to stop by. Joan married C.J. Bruce on October 30, 1948 and they made their home in South Georgia near Savannah, returning to North Georgia and the Jasper area after retirement. In 2003 she moved to Big Rapids, MI to live with her daughter Brenda. Joan was predeceased by her husband of 51 years, CJ Bruce; her parents AE and Ellen Porter; eight siblings, Reuben Porter, Willie Mae Bingham, Mary Lou Terry, Walter Porter, Evelyn Ownbey, Ora Lee Adkins, Herbert Porter, and Arthur Porter; and grandchild Rebecca Miolen. 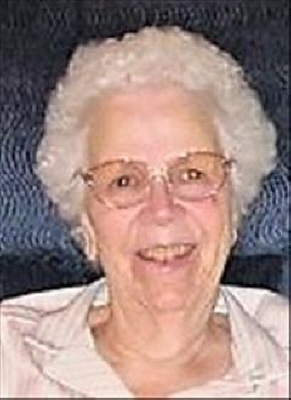 She is survived by her son James Miolen (Patricia), of Newnan, GA; daughter Dorothy Mullinax (D.W.) of Jasper, GA; daughter Brenda Kailing (August) of Big Rapids, MI; sisters Ollie Ogle and Betty Bedwell of Dalton, GA, and Lydia Bishop (David) of Hixson, TN; grandchildren Paula Davis, Oasis Davis, and Karmayne North of Newnan, GA, Ricky Mullinax and David Mullinax (Michele) of Jasper, GA, Benjamin Walworth of Big Rapids, MI, Bethany Hinson (Michael) of Palm Harbor, FL, and Alison Kailing of Big Rapids, MI; great-grandson Sam Mullinax (Kristin) of Jasper, GA, Daniel Mullinax of Jasper; great-great-grandchildren, Elizabeth Mullinax, Alexander Mullinax; and many nieces and nephews. Joan was a member of the Church of Christ, attending regularly until poor health kept her home. She remained a "prayer warrior" until "the good Lord decides it's time." Visitation will be 1:00 p.m. until 2:00 p.m., Saturday, December 8, 2018, at Roper Funeral Home in Jasper, GA.
Funeral Services will follow at 2:00 p.m., with Sam Mullinax officiating. Interment will follow at Sunrise Memorial Gardens in Jasper. To send flowers or a remembrance gift to the family of Joan Porter Bruce, please visit our Tribute Store. "Email Address" would like to share the life celebration of Joan Porter Bruce. Click on the "link" to go to share a favorite memory or leave a condolence message for the family.